New York is one of the most expensive cities to live in, but with so much going on there are amazing deals to be found year-round. With a little web surfing and app downloading, you're bound to find hundreds of free events happening every day of the week. 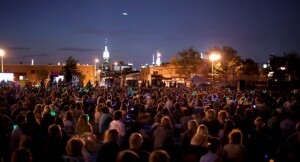 Check out TimeOut New York for the ultimate guide to free entertainment. You can filter through specific dates, planning an adventure-filled weekend or a relaxing weekday to unwind after work. Pick up Frommer's NYC Free & Dirt Cheap, a popular NYC guide, to finding free things to do in the city. Download social apps such as FourSquare, Groupon, Yelp, and Goldstar. Use these to check into restaurants and bars, take classes, go to shows and sporting events, and more, all for a discounted price. You can also check out sites like Vimbly for free or discounted activities around the city. If you're 21+, it is possible to still go out and enjoy NYC nightlife without spending too much money. There are quite a few places that offer free admission to live music shows and performances. Check out Joonbug.com for these listings. Also, most bars offer Happy Hour, a couple hours after work where drinks are discounted. Some places even offer free or discounted food. Visit free museums or go during "pay-what-you-wish" nights. Broadway Week: Every year there is a designated week that allows you to purchase two for one Broadway tickets to some of the city's best shows: Check out the NYC Go site for more information. Or you can buy tickets at a TKTS booth anytime of the year for same-day Broadway tickets that are up to 50% off. There are currently 3 TKTS locations in NYC: Times Square, South Street Seaport, and Brooklyn. Target and UNIQLO sponsor free events in the city including free museum entrances and free performances on certain day of the week. Click here for a list of those free events. Become a fan of Food Network and make your own meals. Explore ethnic neighborhoods. Areas like Chinatown, Little Italy and Little India have great meals for great prices. Take advantage of lunch specials. Many restaurants offer the same dishes for lunch as they do for dinner but for much cheaper. Buy your groceries in Harlem or in the Bronx. You might have to endure a small commute, but you will save yourself quite a bit of cash by purchasing your groceries there instead of the heart of Manhattan. Also, be sure to check out grocery stores' weekly ad or weekly circular to see which items are on sale that week. Order your groceries online and save. Check out services like FreshDirect. These foods come from outside of Manhattan and may be much cheaper than what you'll find in the store. Plus you'll save on the commute. Get Subway Savvy. Don't take cabs if you don't seriously, desperately need to. Spend $112 a month on an unlimited MetroCard instead. Check out our blog post for more tips and tricks for riding the NYC subway. Use your student ID: If you're a student, using your student ID can save you money on everything from food to movie tickets and clothes. You'll find many deals for students around the NYU campus in Greenwich Village. Check out our blog post on how to save money with student discounts while in the U.S. for more information. Buy stuff from Amazon. What you find in the store you might find on Amazon for a much more reasonable price. Use the Amazon bar-code-scanning app to see how much it costs on the website. Work out for CHEAP! Instead of paying hundreds a month for gym membership, check out the NYC Parks and Recreation Centers across the city. Don't pay for WiFi. The city offers a growing number of free Wi-Fi hotspots. Take the subway from the airport. If you're arriving at JFK, you can take the subway for $2.50 each way plus $5 each for the AirTrain, which is much cheaper than taking a cab and paying for tolls. Take a van service from the Airport. If you're not ready to try out the subway there's a van service. The ride is about $10 - $25 per person and will take you right to your destination. Don't pay to go swimming. Each summer there are a handful of swimming pools across the city that are free and open to the public as well as plenty of beaches. Sign up for a few coupon sites. There are TONS of coupon sites that focus on NYC: Groupon, Living Social, Google Offers, Bloomspot, Yippit, etc. Check out our guides on what to do, see and eat in Manhattan, Brooklyn, Queens, The Bronx, and Staten Island! Check out our budgeting guide for more tips on how to make the most out of your time in the U.S.